There is an urgent need for accessible, acceptable, and appropriate mental health supports in Missouri. Missourians are increasingly aware of, and alarmed by, the significant gap between serious mental health problems and mental health supports. Missouri is ranked 31st in the nation on effectively addressing issues related to mental health and substance use among children and adults. This lag results in serious and long-term personal, societal, and economic consequences. Improving Missouri’s response at a state-level requires innovative, strategic efforts that are responsive to the diverse landscape of local community needs and resources across this state. In August 2016, the Centers for Disease Control and Prevention (CDC) made headlines for reporting that, for the first time in modern history, suicide is now the second leading cause of death for young people ages 10-14. The suicide rate for these middle school-school age children doubled between 2007 and 2014. The Department of Mental Health estimates that serious mental illness costs Missouri $10.8 billion every year, and that tab does not include the additional burden of substance use. Beyond the tragic, personal impact of suicide on Missouri citizens and communities, every suicide death in this state averages a cost of $1,302,000 in lifetime medical and work-loss costs. More than twice as many Missourians die by suicide than homicide each year, and every suicide death costs $550,000 more than death by homicide. 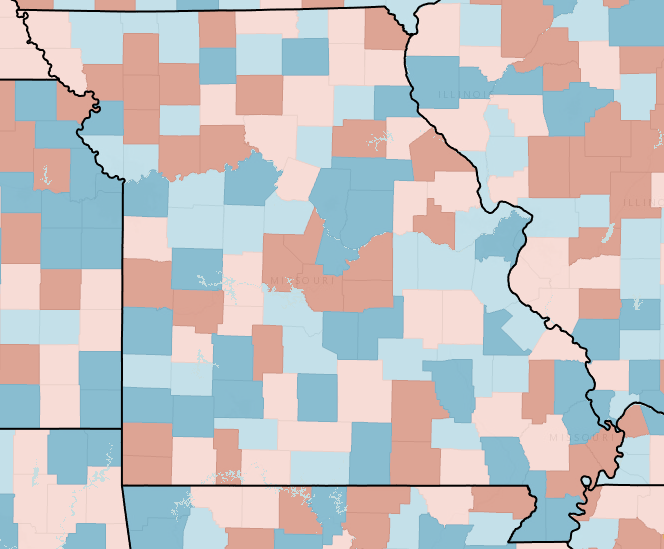 Suicide rates in Missouri vary by county along with access to mental health care. 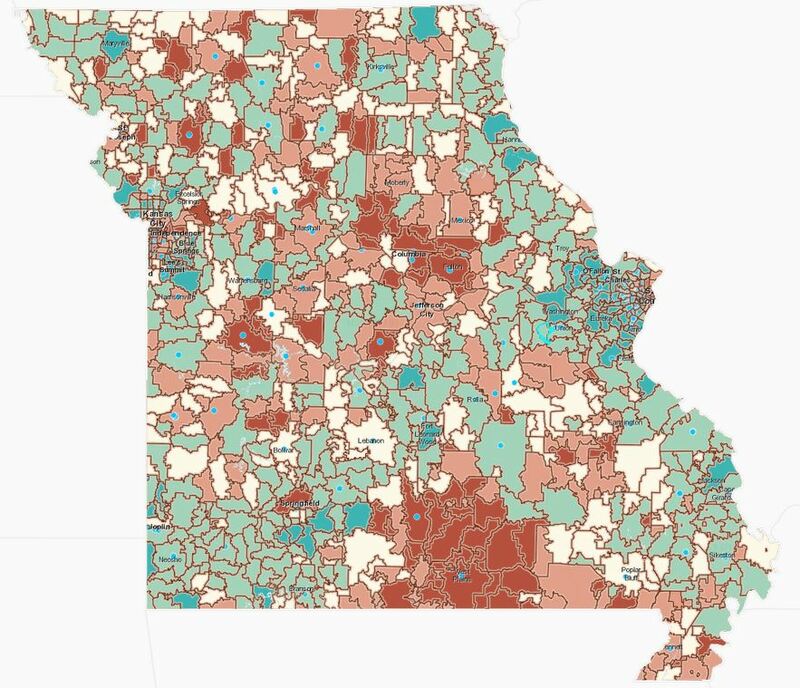 The map below shows how Missouri counties rank on access to mental health providers. Missouri counties ranked by access to mental health care providers. Department of Elementary and Secondary Education to “discuss what matters most in public education.” Other state agencies, particularly Missouri’s Department of Mental Health and Children’s Division (Department of Social Services), are leading local and national conversations about using a trauma-informed lens to advance public mental health. The Missouri Model: A Developmental Framework for Trauma-Informed and Trauma Informed Pathways to the Five Domains of Wellbeing are influencing the uptake of trauma-informed philosophies across sectors in Missouri. Both build on and contribute to a growing scholarship on the prevalence of trauma, how trauma affects development, and the impact of trauma on a variety of significant economic and societal factors. The Division of Violence Prevention at the Centers for Disease Control and Prevention (CDC) conducted seminal research on “Adverse Childhood Experiences” (ACEs) that heightened national awareness of the prevalence and long-term impacts of stress and traumatic events. It is estimated that two-thirds of adults have at least one ACE, and a majority of people with one ACE have more than one. Research suggest ACEs have an additive effect in terms of long-term impacts; as ACEs increase, so does the likelihood of a variety of negative outcomes. These outcomes lower life expectancy and cost an estimated $124 Billion annually. Click on this infographic to explore how an individual’s ACE score affects behavior and health outcomes. The map below shows risk for Adverse Childhood Experiences (ACEs) by zip code. ACEs risk can be explored by school district, county, or region, and/or in conjunction with other key indicators (e.g., unemployment, health outcomes, access to care). Schools are impacted by children’s mental health problems but also serve as a critical context for intervention. 1 in 5 young people in this country suffer from a mental health disorder. Half of all lifetime cases of mental illness begin by age 14, and the average delay between onset of symptoms and intervention is 8-10 years. A majority of young people with mental health problems do not receive the treatment they need; those who do are likely to receive those supports in schools. Schools have been promoted as the ideal context to bridge the significant gap between mental health needs and resources. Schools provide unparalleled access to young people and increase opportunities to promote mental health, prevent mental health problems, and identify youth with additional needs early. In many communities, schools are now the de facto children’s mental health system. Unfortunately, not all schools have the resources to respond to the mental health needs of students and national best practice recommendations for school mental health emphasize shared responsibility and funding. Schools cannot meet the mental health needs of students without a significant investment of resources from external partners and agencies. The foundation of a successful school mental health program is a strong collaboration between school-based mental health professionals (School Counselors, School Psychologists, School Social Workers) and community mental health partners. Programs cannot be effective without strong and sustained support from school leadership. Missouri schools vary in their capacity to strengthen and sustain effective, efficient school mental health programs. First, there is a significant shortage of school-employed mental health professionals in Missouri. Ideal v. Actual ratios of school-employed mental health professionals per Missouri student: School Counselors (250:1,352:1); School Psychologists (500 to 700:1, 3230:1); School Social Workers (250:1,1555:1). As evident, most school districts in this state have only schools counselors on staff, and many school districts employ a single school counselor. Mental health services (i.e., responsive services) are just one component of a Comprehensive Guidance and Counseling Program. Overall, the workforce shortage of school-based mental health professionals in this state limits the degree to which schools can implement any kind of mental health programming internally and impacts how well a school can connect with critical community partners such as local community mental health agencies. The Missouri Department of Mental Health reports that more than 82% of the estimated 97,000 young Missourians who needed treatment for serious mental health problems in 2015 did not receive public mental health supports. While these data do not reflect the number of young people who accessed mental health treatment outside of the state system, the accessibility of mental health care in this state depends on where you live. In fact, only nine of Missouri’s 114 counties are not designated as Mental Health Professional Shortage Areas. Missouri has a “Severe Shortage” of Child and Adolescent Psychiatrists: the majority of counties in this state do not have a single Child and Adolescent Psychiatrist. The scarcity of mental health professionals, both school-employed and in the community, heightens the need for strong partnerships between schools and community mental health agencies. There are 25 mental health service areas in Missouri, and there is a designated administrative agency for each service area (some service areas have a common administrative agency). Community Mental Health Centers and/or affiliates within each service area are responsible for delivering public mental health services to Missouri citizens who live in the county or counties within their service area (click for interactive map of service areas with contact information for each service area). Each of these 25 service areas covers 1 to 10 counties. Those centers and/or affiliates also serve the school districts geographically located within their service area.According to the Missouri Department of Elementary and Secondary Education (DESE), there are 518 school districts, and 38 Charter schools, in Missouri. District enrollment varies from 23 students (New York R-IV) to more than 25,000 students (Springfield R-XII). This map shows public schools and district boundaries within each of the 25 mental health service areas, as well as mental health facilities. School district boundaries do not always follow county borders, so a single school district may enroll students from a variety of counties that may be in different mental health service areas. The Missouri Department of Mental Health provides a variety of children’s program’s and services. Adolescent substance use services are available for young people ages 12 to 17. These programs are organized into 5 regions supported by 4 regional offices. Community mental health and substance use services may or may not be delivered by the same provider in a county/region. While mental health (and substance use) services are defined and contracted at the state level, each administrative agency functions independently. School mental health programs are promoted as an ideal solution to address the children’s mental health gap in this state. For school mental health programs to fulfill their promise, local school leaders must be equipped to navigate incredible complexity. aders are pivotal in promoting effective and efficient school mental health programs in Missouri, there must be a strong state and regional infrastructure to support school leaders. 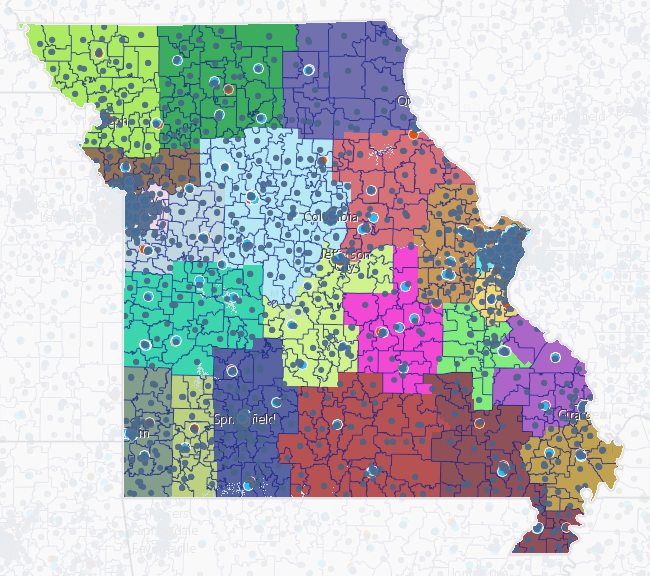 This map layers 8 Missouri Association of School Administrators (MASA) regions onto Missouri’s mental health service areas. Adjusting the transparency of the services areas and/or the MASA region layers identifies opportunities to strengthen regional infrastructures to build Superintendents’ capacity to lead effective and efficient school mental health programs in Missouri.